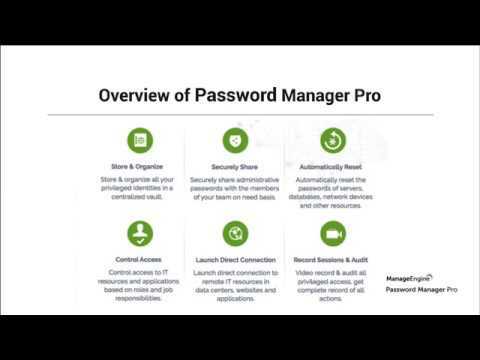 Password Manager Pro software is a secured solution for storing and managing sensitive information that includes passwords, documents and digital certification for various businesses. The software caters to all type of business customers that helps eliminate password weakness and security lapses. Also, the user has an option to deploy centralized vault password storage and access within the software. The software also provides preventive and detective security controls with real time alerts on password access. IT specialists recommend adopting a mature security policy to standardize password management practices. An IT security policy generally covers various aspects, such as: Using strong passwords. Rotating passwords regularly. Changing passwords after temporary usage. Implementing robust access controls. Auditing user activities related to privileged access. Today's organizations depend on a large number of business applications, web services, and custom software solutions to fulfill business communications and other transaction requirements. Normally, various applications require access to databases and other applications frequently to query business-related information. This communication process is usually automated by embedding the application credentials in clear text within configuration files and scripts. Administrators usually find it difficult to identify, change, and manage these passwords. As a result, the credentials are left unchanged, which may lead to unauthorized access to sensitive systems. Thus, hard-coding credentials may make technicians' jobs easier, but it is also an easy launch-point for hackers. Password Manager Pro eliminates the use of hard-coded passwords with secure APIs for application-to-application (A-to-A) and application-to-database (A-to-DB) password management. In most of IT environments, Windows servers and systems are a significant component of the infrastructure. Local, domain, and service accounts constitute the core access to the Windows infrastructure. So, a breach of any of these high-privileged accounts is the worst-case scenario for any organization. Convenient as it may be for IT teams to use the same password for every privileged account on the network, the practice is unhealthy and ultimately fosters a fundamentally insecure environment. Secure management of privileged accounts requires the usage of strong, unique passwords that are periodically reset. Password Manager Pro's automatic password reset capabilities help get rid of unchanged passwords and protect your sensitive resources from unauthorized access. Automatically assign strong passwords for remote resources and rotate them periodically. Password Manager Pro provides password reset support for a wide range of target systems. Passwords can be changed any time on demand or automatically randomized at periodic intervals through scheduled tasks. Privileged account passwords are not the only sensitive data that must be managed. There are scores of other important records that have to be protected and circulated with respect to your environment, such as online web accounts, digital certificates, license keys, documents, and images. Password Manager Pro's centralized vault is configured to support secure storage and retrieval of all such critical security objects. These entities are treated the same as privileged passwords–dually encrypted once at the application level and again at the database level with the AES-256 algorithm. They can also be selectively shared among users. By default, Password Manager Pro supports management of: Web accounts and applications. Private and public keys, digital certificates, and digital signature files. Software license keys. Documents, images, and executables. Automate discovery and security of privileged accounts in your environment. Privileged accounts are soft targets for hackers and often prove to be at the root of advanced data breaches and internal attacks. Therefore, the first and foremost step to secure and manage your privileged accounts must be discovering all critical assets and their associated accounts and credentials on the corporate network. Password Manager Pro's fully automated discovery engine is built to secure privileged accounts and address any associated vulnerabilities. It can discover and enumerate the following: Windows local and domain accounts, including service accounts via Active Directory import. Network devices such as switches, routers, and firewalls by using SNMP discovery options. Virtual devices (VM Guests), through VMware ESxi discovery. Linux devices by specifying an IP range via Telnet protocol. External identity stores (such as Windows Active Directory) are common deployments today in enterprise environments for user management, authentication, and provisioning. Therefore, leveraging the AD (Active Directory) setup while implementing security controls for your organization saves a lot of time in the onboarding process. Import, authenticate, and provision. Simplified user management. Password Manager Pro's AD and LDAP integration capabilities enable quick user importation. The database constantly synchronizes with the directory, and is automatically updated whenever users are added or removed in AD. In addition, Active Directory's authentication and single sign-on capabilities can be extended to Password Manager Pro, letting users log on with their AD or LDAP credentials. Moreover, users logged on to their Windows applications already can log on to Password Manager Pro without supplying credentials. Clone AD groups in Password Manager Pro, and quickly perform bulk operations. When you can replicate AD groups and organizational units (OUs) as user groups in Password Manager Pro, password sharing operations are a lot easier. For instance, you can quickly allocate passwords in bulk to users based on AD groups, such as database passwords to database admins, and root passwords to UNIX admins. Consolidate all your passwords into one secure, centralized repository. With the proliferation of privileged accounts in enterprises, the number of passwords that must be protected has also grown substantially. Tracking all these passwords is a daunting task and, eventually, people write them down or store them on spreadsheets and other electronic platforms. However, such practices are dangerous and may lead to unauthorized users gaining access to the passwords. Moreover, when remote teams maintain such localized password databases, there will be increased instances of outdated passwords and coordination issues, impacting operational efficiency. To avoid mismanagement of sensitive passwords, you need to inventory the passwords belonging to all your departments under a centralized repository and administer direct control over them. Password Manager Pro serves as a centralized password vault and helps consolidate account credentials in one single place by directly adding or importing from CSV and TSV files. Apart from that, it also offers centralized management, defense against intrusion, and fine-grained permission levels. While password resets are vital, they are occasionally tailed by follow-up actions that are just as important. Password Manager Pro allows you to carry out similar tasks by invoking scripts or executables, referred to as Password Reset Listeners. Use Reset Listeners as custom connectors for unsupported systems. Password Reset Listeners can be used as custom connectors to effect password resets for target systems that are not covered by default in Password Manager Pro. When invoked, Reset Listeners establish a connection with the target system and carry out required password changes. You can also configure the Listeners to connect with the target system regularly and perform periodic password resets. Carry out follow-up actions after password resets. Password Reset Listeners enable swift completion of various follow-up actions without any manual intervention. You can cover a wide range of tasks such as local password changes, dependent service restarts after a service account password is reset, and network device password changes after resetting the passwords locally. To exercise complete flexibility in any post-reset execution, there are also options to customize the Listeners with your own implementation class, instead of letting Password Manager Pro execute the Listener script provided by you. Q. Why are my users not notified of their PMP accounts? Q. What are the authentication schemes available in PMP? You can use one of the following three mechanisms: Active Directory: When enabled, the authentication request is forwarded to the configured domain controller and based on the result, the user is allowed or denied access into PMP. The user name, password and the domain are supplied in the PMP login screen. This scheme works only for users whose details have been imported previously from AD. Available only when PMP server is installed on Windows system. LDAP Directory: When enabled, the authentication request is forwarded to the configured LDAP directory server and based on the result, the user is allowed or denied access into PMP. The user name and password and the option to use LDAP authentication are supplied in the PMP login screen. This scheme works only for users whose details have been imported previously from the LDAP directory PMP Local Authentication: The authentication is done locally by the PMP server. Irrespective of AD or LDAP authentication being enabled, this scheme is always available for the users to choose in the login page. This scheme has a separate password for users and the AD or LDAP passwords are never stored in the PMP database. Two Factor Authentication: Option to enforce users to identify themselves with two unique factors before they are granted access to PMP web-interface. While the existing authentication mechanism of PMP (native authentication / AD / LDAP) will be the first authentication factor, the second authentication factor could be either a unique password generated by PMP and sent through email or RSA SecurID one-time password, which changes every sixty seconds. For RSA part, PMP has entered into a technology partnership with RSA SecurID two-factor authentication system. Q. What if I forget my PMP login password? If you were already given a valid PMP account, you can use the 'Forgot Password?' link available in the login page to reset the password. The user name/e-mail id pair supplied should match the one already configured for the user and in that case, the password will be reset for that user and the new password will be emailed to that email id. Q. Why does Internet Explorer 7 (and other browsers) complain while accessing PMP console? The PMP web console always uses HTTPS to communicate with the PMP server. The PMP server comes with a default self-signed SSL certificate, which the standard web browsers will not recognize and issue a warning. Particularly IE 7's warning message appears serious. Ignoring this warning still guarantees encrypted communication between the PMP console and the server but if you want your users to be particularly sure that they are connecting only to the PMP server, you will need to install a SSL certificate that you have bought from a certificate authority, that is recognised by all standard web browsers. Q. Is there a way to do remote password reset for resource types other than the ones for which remote reset is supported now? Yes, you can make use of Password Reset Listeners, which enable invoking a custom script or executable as a follow-up action to Password Reset action in PMP. Refer to Password Reset Listener for more details.